If you’re looking for San Diego vacation ideas, you’ve come to the right place! 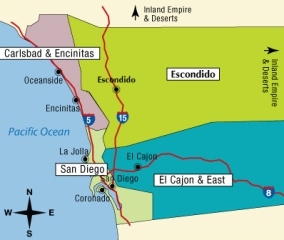 About three million people live in San Diego County, roughly 1.3 million of those in the city of San Diego, itself. The Golden State’s second largest city bills itself as “America’s Finest City,” which may seem like hyperbole… until you travel there! Bounded by Camp Pendleton to the north, Mexico to the south, the 600,000-acre Anza-Borrego Desert State Park to the east and the Pacific Ocean to the west, you’ll find an amazing mix of cultures and geography here, as well as a seemingly endless array of entertaining diversions. Many people find that it takes several vacations to experience all there is to enjoy in just the city of San Diego, much less all the areas surrounding it. While you could spend the better part of a week just perusing the lovely grounds at Balboa Park and investigating its outstanding museums and the 100-acre, world-famous San Diego Zoo, you wouldn’t want to miss the downtown and waterfront nor the fun to be had at Pacific, Ocean or Mission Beaches. The last one in that list, Mission Beach, offers a whole host of opportunities for fun, including Sea World and Belmont Park, a restored and treasured landmark amusement park that first opened in 1925. More entertainment can be found among the shops and galleries in La Jolla (about 10 minutes north of downtown and sometimes referred to as “San Diego’s Beverly Hills”) or the exclusive enclave on Coronado Island (actually a peninsula and accessible by car over the Coronado Bay Bridge or via the Bay Ferry from downtown’s Broadway Pier). If you’re heading out of San Diego proper — and especially if children are part of your traveling group — you may want to visit Legoland (in Carlsbad, about 30 minutes north of downtown San Diego) or the Wild Animal Park (in Escondido, another 15 minutes or so east of Carlsbad). Wild Animal Park is an 1800-acre division of the San Diego Zoo that offers a “safari-type” setup where animals roam free. Adults might enjoy the race track at Del Mar (as well as its broad, white sand beach) or perhaps a bit of gambling at the casinos in El Cajon or Alpine. History buffs might want to explore the Mission San Luis Rey in Oceanside or take a longer excursion to the town of Julian, a charming village that once played a role as southern California’s connection to the Gold Rush and is now largely prized for its surrounding apple orchards. Travelers who want to venture south into Mexico should bring their passports. Tijuana, about 30 minutes from downtown San Diego and the world’s busiest border town, is more “tourist” than “authentic” Mexico, but many visitors enjoy the shopping and nightlife opportunities. If your visit falls on a Sunday between May and September, you might also enjoy attending a bullfight. Bus transportation is available. If you drive, park your car at the border and walk across.